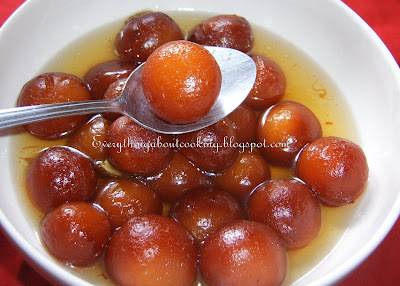 I'm now a proud member of Indian Cooking Challenge started by Srivalli .This months challenge is to make gulab jamun.Gulab jamun...deep fried balls of heaven with sugary syrup which melt in your mouth.........Sure I make gulab jamun once in a while with the ready mix but never with khoya and to top it home made khoya and thats the challenge.I never made khowa so this is a challenge for me.It took me two hrs to make khoya. I followed Alka's method with a few changes of my own. Heat a thick bottomed vessel and add the sugar,saffron and water and bring to a boil.Remove the scum which forms on the top with a ladle.Now add the cardamom pwd.The syrup should not be too thick nor too thin.Add more water and sugar if required.Switch off when the syrup get to the desired consistency and add the rose water.Keep aside.Always prepare the sugar syrup before frying the jamuns. 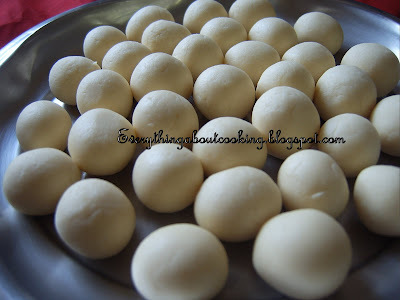 Mix all the ingredients except chocolate into a soft dough adding moisture if required.Now make small balls and stuff each ball with one chocolate chip and form round balls again.They should not have any cracks on them.Fry the jamuns in a deep kadai on low flame to ensure that the middle is also completely cooked.Donot disturb the jamuns when cooking.turn only once or twice or they will break.Fry till they are golden brown and remove with a slotted ladle and immediately add to the sugar syrup.Let sit for atleast 30 mins to an hour inorder for the gulab jamuns to absorb the sugar syrup.Can be served warm with vanilla ice cream or chilled before serving.Enjoy!!!!! When making making the jamuns wet hands in water to ensure crack free balls.Fry one jamun first.If it come out flat add a little more maida to it. 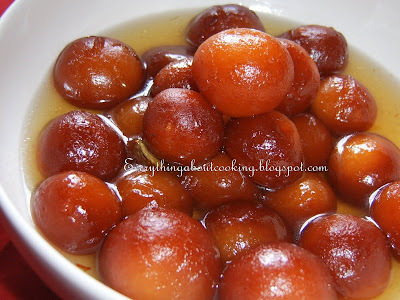 You Gulab Jamuns are in perect rounds! Oh wow! 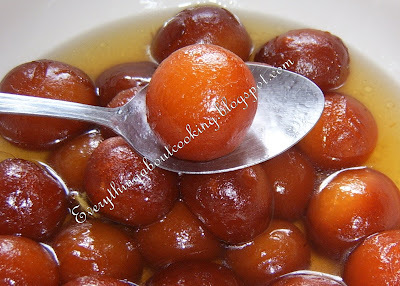 What delectable gulab jamuns and beautiful clicks.